So we have had a few visitors to our place today. Firstly, I arranged after school yesterday for the Pickle's friend Rachel to come over and play this morning. The Pickle was very happy! Now we have two little girls giggling in the house. Here they are exploring the gunyah. Secondly, when we came home from horseriding this morning, there were ants in the pantry. And in the living room. And in the kitchen. And all over the place. Yikes! 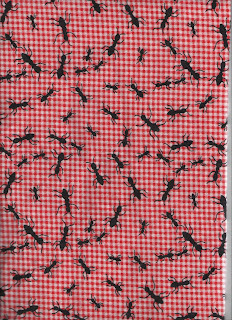 I went on the war path, singing "The ants are marching two by two, hurrah! hurrah!". I think I may have embarrassed the Pickle in front of her friend, oops. I hope this invasion means it is going to rain, I planted some roses during the week and I would like them to be watered in. I don't have a picture of the ants, as I was too busy terminating them to take a photo. 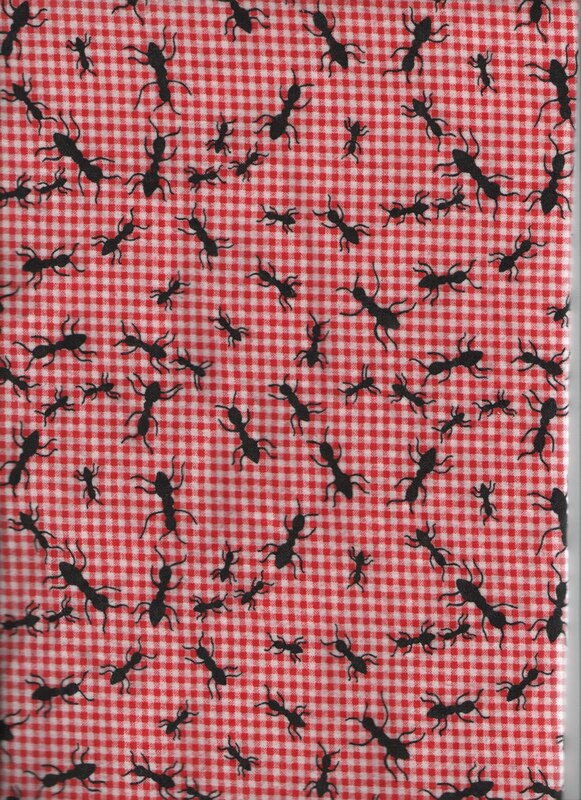 But here is some cute ant flannelette fabric that came in the mail last night. I plan to make a baby quilt with this, I have never made a flannel quilt before and I like the idea of it. Another thing I found when we got home was wheely bins. Since moving out here we have not had a garbage bin, it is too far for the council to send the garbage truck out. We don't make much rubbish since we have a giant worm farm and do a lot of recycling, but it will be nice not to have to take the rubbish into town. We have arranged for a contractor to come and collect the garbage once a fortnight, and he came out this morning to drop off our new bins. The Pickle has been allocated the job of wheeling the bins up and down the drive each week. Lastly, the girls were very, very excited to find a wombat in the back yard. We have gazillions of kangaroos, but this is the first wombat we have seen at our place. I am pretty sure that now that it has met our two dogs it will be heading for a more peaceful home somewhere else. But I would like it if it decided to stay and live under a tree stump. I love your wombat! The only things I ever see around my house squirrels, rabbits, racoons, and opossums. Wish we had more interesting animals here in the states. And I love your flannel. I use it a lot in quilts, so I hope you like it. Such a cute wombat. Found you via Book Blogs and wonder if you might like my blog about vintage children's books.